The Kyocera Hydro comes in a water resistant chassis with IPx5 and IPx7 Ratings that protects the phone at depths up to 1 meter and for as long as 30 minutes under water. It's a model with both a QWERTY keyboard and touch-screen. The screen slides up to reveal the QWERTY keypad. Kyocera Hydro features 3.5-inch HVGA capacitive LCD display with 320 x 480 pixel resolution and IPS, powered by 1GHz single-core Qualcomm Snapdragon processor with 512MB RAM and runs on Android 4.0 ICS OS. It comes with 2GB of storage. 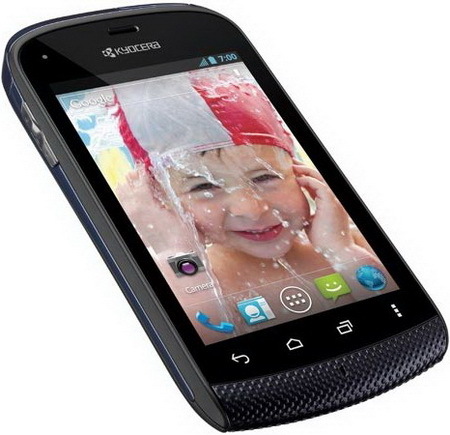 Kyocera Hydro sports a 3.2 MP rear camera with a built-in flasha, up to 32 GB expandable microSD card slot, Bluetooth 2.1, Wi-Fi and a USB 2.0 port. The phones also feature 3-axis accelerometers, digital compasses, proximity sensors and ambient light sensors. The Kyocera Hydro will be available for purchase in Q2 2012 but pricing is unknown. Tags: Hydro, Kyocera, Smartphone, water-resistant, Kyocera Hydro, Kyocera Hydro features, Kyocera Hydro specifications, Kyocera Hydro review, Kyocera Hydro details, Kyocera Hydro availability, Kyocera Hydro specs, Kyocera Hydro images, Kyocera Hydro pics, Kyocera Hydro pictures, Kyocera Hydro imgs, Kyocera Hydro price,Kyocera Hydro Network options, Kyocera Hydro Expansion options, Kyocera Hydro multimedia features, Kyocera Hydro Sensor options, Android 4.0 ICS OS smartphones.